Create a hyper-localized app for Altitude Tickets that integrates the full-circle ticket buying process, improves mobile experience and user interface, and simplifies the information architecture. In order to access tickets purchased through Altitude Tickets, users are required to download the Flash Seats app. This frustrates users who would rather buy and store their tickets in one place. Users also struggle to find bathrooms, vendors, drinks, and friends at venues. Research insight showed that the initial excitement of planning an event drops pretty quickly when it come time to purchase the tickets. Another round of usability testing revealed a few issues with the low-fi mockup. The icons were a bit too heavy, which caused some users to have to squint in order to see them. The first home-screen iteration had too many icons and lacked brand colors. The icons also seemed a bit too heavy and the overall design was a bit too cluttered. The first event detail screen was not leveraging the screen size enough. The solution was to replace the module concept with a simple back button, and expand the screen to full width. The first ticket screen leaned towards skeuomorphism. This effect dated the look of the app and was changed to a cleaner and more simplified look using the Apple HIG as guidelines. User testing insights revealed that the augmented reality screen had too much information on it and confused the user. The update was simplified to just the name of the bar. 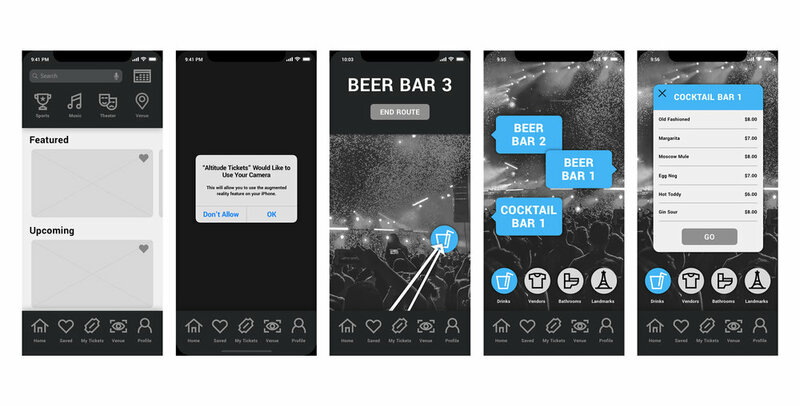 Research showed that event-goers needed a simple and intuitive way to locate bars, vendors, and friends inside event centers. Through augmented reality, users are able to leverage the actual event-space to easily navigate through a crowded event. Custom icons were created to maintain brand consistency throughout the app. The icons are meant to be simple yet easy to identify, while not overtaking the user interface. Understanding where the greatest pain points were helped to understand which issues to solve. Having the capability to go full-circle with transparent pricing was key to building a successful event ticket-buying app.